Aside from Animal rescue Gillian's other passion is travel. She is a market trader at heart, her first Saturday job as a child was in a gaudy jewellery stall aptly named “Sylvias Grotto”, late in life she ran an Antique shop in the US , but most interestingly in her early 20’s she sold carpets in the Grand Bazar in Istanbul. She still visits Istanbul regularly, and is really at home in the alley ways of the Grand Bazar. Last November found her buzzing around the back streets of Jaipur in search of semi precious stones and pashminas. Bananas Boutique is a reflection of her tastes in the ethnic and unusual…and everything in it is curated personally by her on her many trips abroad. 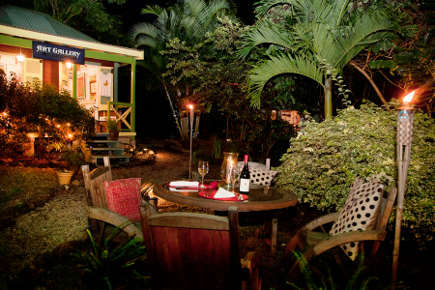 The boutique is housed in a cute west indian Chattel house and is a real life "Aladdin’s Cave". "Totally Bananas" boutique also features locally made jewelry, hot sauces, pottery , soaps and booked published by local authors , not to mention homemade Banana Rum !! The walls of the Restaurant are a constantly changing display featuring selected Caribbean Artists both from Nevis and from the neighbouring Islands. All of the pieces are original (occasionally, limited edition Gicles are exhibited) and we have styles and prices to suit all budgets and tastes. World Wide shipping is available. Round off your visit with a cocktail or light lunch and enjoy the gardens and the view.